Twelve thousand years after Genesis of Aquarion, the planet Vega is under attack by enemies from the planet Altair. To defend Vega, a group of young men and women with special powers pilot robots called Aquaria to defend the women of their planet from the invading abductors. Amata Sora felt that fate was just passing him by until he met Mikono Suzushiro during a screening of his favourite movie. During their date after the movie, they are attacked by abductors from the Altair, a planet that has no women and whose people are forced to kidnap from neighboring Vega to sustain themselves. However, a group of young men and women known as “Elements” arrive in Aquaria to stop the abductors but are quickly beaten back. In the midst of this conflict, Amata discovers that he could be the key to stopping the abductors for good. 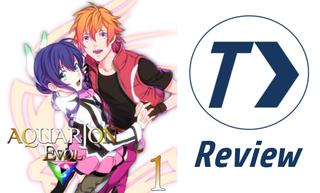 Aquarion Evol will be of interest to fans of the mecha genre as well as Aquarion fans. Aquarion Evol Vol. 1’s story was engaging, with the conflict between Neo-DEAVA and the abductors from Altair functioning as a compelling premise. There is some very solid potential here as the volume gives some interesting hints towards hidden aspects of the conflict which will likely become plot points later. I enjoyed the way more and more story elements were unveiled, with the later chapters in the volume really beginning to flesh out the world of Aquarion and making me eager to read future volumes to see how it develops. The pacing of this volume’s story was also good, alternating faster and more exciting moments with opportunities for the reader to catch their breath while developing the main characters. Scenes never felt like they dragged on for longer than necessary, developing the plot and keeping me engaged throughout the volume. While it was not an emphasis by any means, the humour of Aquarion Evol was also enjoyable, helping to lighten the tone and break up the otherwise serious work. For me, the funniest moment came in chapter 3 during Amata’s attempt to get Mikono’s forgiveness for a previous gaffe. I won’t spoil it, but I thought it was cleverly done, providing some good comedic relief while simultaneously developing his character a bit more. Aquarion Evol’s premise is engaging, its execution leaves a lot to be desired. While I noted above that I enjoyed the way more story elements were introduced gradually towards the end of the volume, I don’t feel the initial plot set-up was articulated as well as it could have been. Certain aspects and events in the first few chapters would have benefited from more exposition and context, and as a result I felt as though I had an incomplete understanding of what was transpiring when the abductors attacked and the Aquaria arrived. This was not helped by an attempt to tell a small part of the story in flashback, making it more difficult that it should have been to piece together what had happened. I had to read through a few of the chapters multiple times to really get a sense of what was going on, and the volume would have been greatly improved if there was a little more context provided early on. The art was another fairly serious drawback of this volume, as the mecha scenes in particular were not drawn effectively. Some of the panels were cluttered, making it difficult to tell what was happening during some close-ups as well as to differentiate between the abductors and the Aquaria. While this wasn’t a crippling issue, it did hold back certain scenes from having the impact they might have otherwise had. In addition, the character designs in general were functional but not particularly memorable, looking giving a very generic feel to the art. Aquarion Evol Vol. 1 sets up an interesting story but is held back by some odd storytelling choices that make its events less clear than they could have been. The middle chapters are particularly shaky, with cluttered images hurting the impact of the action scenes. However, the later chapters in this volume are much better and set up the story effectively, making me eager to read the next volume. Once you get past its lackluster opening half, Aquarion Evol Vol. 1 shows some good potential to be an enjoyable action series worth looking into. Media Works’ Monthly Comic Gene magazine. Volume 2 will be published in English on June 16th, 2015.